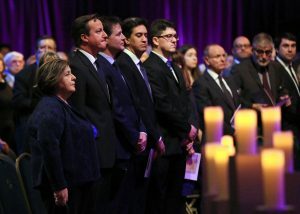 The nation's Holocaust Memorial Day 2015 UK Commemorative Ceremony, organised by Holocaust Memorial Day Trust (HMDT) took place yesterday (27 January) at Central Hall Westminster, with a huge gathering of survivors, dignitaries and celebrities participating in a moving and poignant event. Over 1,000 guests came together to mark HMD on the 70th anniversary of the liberation of Auschwitz and crowning over a year of hard work from the staff here at HMDT. The ceremony was broadcast on BBC Two. Survivors and their experiences were at the heart of the day, reflecting the HMD 2015 theme Keep the memory alive and ensuring that we pay respect to their unimaginable suffering while retaining the lessons of the past for future generations. The ceremony commenced with a procession led by six survivors, the Prime Minister, Deputy Prime Minister and Leader of the Opposition, and Their Royal Highnesses the Prince of Wales and the Duchess of Cornwall, beginning a powerful programme of music, testimony and film produced in collaboration with the BBC. Actor Adrian Lester OBE narrated the proceedings, first introducing the Aldeburgh Young Musicians performing Eliyahu Hanavi, which was arranged by Viktor Ulmann, a composer who was murdered in Auschwitz on 18 October 1944. Significantly, the young choir was conducted by Simon Wallfisch, the grandson of Holocaust survivor and member of the Auschwitz Girls’ Orchestra Anita Lasker-Wallfisch. Other celebrities contributing to the ceremony included actor Sir John Hurt reading Primo Levi’s poem Shema, actor Keeley Hawes reading a letter written to a child saved by Sir Nicholas Winton, and Michael Palin speaking the words of ill-fated Sonderkommando member Salmen Gradowski. Natasha Kaplinsky talks about the other victims of Nazi Persecution. Member of the Prime Minister’s Holocaust Commission Natasha Kaplinsky and actor Sarah Lancashire brought the audience’s attention to the Nazi Persecution of Roma, gay and disabled people, while actor Christopher Eccleston read Elie Wiesel’s moving poem Never shall I forget. Survivors took centre stage in a series of short films made by the BBC interspersed into the commemorations. Life in pre-war Europe featured Otto Deutsch and Iby Knill speaking about the escalating discrimination they experienced growing up, while Iby, Ivor Perl and Renee Salt spoke of the horrifying conditions inflicted on them in ghettos and concentration camps. While 1945 brought about the end of World War II, it would not be the last time Europe saw concentration camps in the 20th century. The audience was reminded of this grisly reality in the film The Bosnian War, featuring Omarska concentration camp survivor Kemal Pervanić. The breadth and spread of HMD commemorations in the UK were highlighted in a film for the 70 candles for 70 years project, which visited three of the locations where Sir Anish Kapoor’s specially-designed candles were lit. 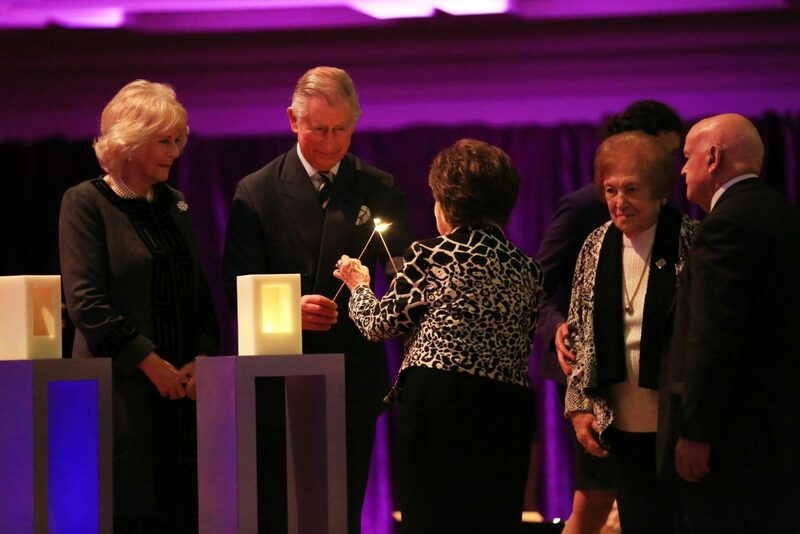 Six of these candles, representing not only the six million Jews murdered in the Holocaust but also each of the atrocities marked on Holocaust Memorial Day, were lit by survivors Ben Helfgott MBE, Lily Ebert, Sabina Miller, Ann Kirk, Agnes Grunwald-Spier and Safet Vukalić in Central Hall, together with the Their Royal Highnesses Prince of Wales and Duchess of Cornwall. Perhaps the most evocative and pertinent of the films, in regards to our work at HMDT, was Survivors explain why they speak. Survivors feeling so passionately about ensuring people hear their life stories, and learn the lessons these accounts teach, encapsulates and affirms what we do as an organisation for Holocaust Memorial Day. ‘For first 50 years after liberation we didn’t talk about it, but eventually we realised if we don’t talk about, if we don’t tell the world, people won’t know,’ said Holocaust survivor Renee Salt. Prime Minister Rt Hon David Cameron MP used his speech to announce his support for the conclusions of the Holocaust Commission, to invest £50 million into a Holocaust memorial and education centre in central London. Concluding the event were the Aldeburgh Young Musicians, conducted by Simon Wallfisch, who performed I believe in the sun, which was composed by Howard Goodall for the UK’s first ever Holocaust Memorial Day commemoration in 2001. HRH the Prince of Wales and HRH the Duchess of Cornwall speak with Holocaust survivor Agnes Grunwald-Spier. The ceremony was preceded by a special reception for survivors and refugees. 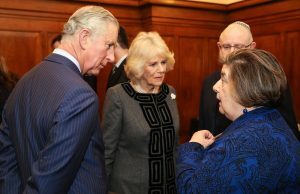 Guests at the reception included Their Royal Highnesses Prince of Wales and Duchess of Cornwall, the three party leaders, the Archbishop of Canterbury, celebrity contributors to the ceremony and members of the Holocaust Commission. ‘The Holocaust Memorial Day 2015 UK Commemorative Ceremony was the focal point for activities the length and breadth of the country. It was dignified, hard-hitting and also uplifting, and we are delighted that it enabled the nation to keep the memory alive,’ said Olivia Marks-Woldman, chief executive of HMDT.